Earlier this year I made two presentations called Gorgeous+Catastrophic, in which I show six sci-fi interfaces that are both beautiful to behold and that would be disastrous if implemented in the real world, all to illustrate why we should keep interfaces in sci-fi at arm’s length and evaluate them with a critical eye. It’s a fun talk to give. You should totally ask me to come present it at your local conference. But in one of the talks, when I introduced the first of the six examples—the medpod interface from Prometheus, starting around 06:35 in the video—I misattributed the whole design to Territory Studio. This was oversimplifying the team on a couple of levels, so let me make the formal correction and apology here. Territory Studio did work on Prometheus, and even did work on the medpod: They did the VFX interfaces shown around 07:50, and were joined by teams from Fuel VFX and Compuhire. They did not do the on-set touchscreen that sits on the side of the medpod that Noomi Rapace/Elizabeth Shaw touches directly starting around 07:28. That was designed by Shaun Yue, working as an individual contractor. An additional complication is that George Simons, who was graphics supervisor on the film, is now with Territory, but was not then. And then, there’s the credits, which only list names, not companies, and not full teams. Mea culpa. I should have known better, since I even have an interview with Shaun Yue on this blog about that movie. It’s a small competitive field, and proper credit is hard to get. It’s functionally advertising, so this mistake isn’t minor. My apologies to Shaun, George Simons, Rheea Aranha, John Hill, Paul Roberts, Daniel Burke, Mark Jordan, Eliot Eveson, and Adam Stevenson. If I give the same talk again I won’t make the same mistake. It doesn’t excuse the mistake (and I’m glad I have this forum to right the wrong) but I will note how very difficult it is to get attribution of scifiinterfaces correctly. A sci-fi interface is a pie with a lot of fingers in it. If it’s central to the plot, then the writer will have described what it does in the script. The director will have had (in this case) his opinions as well, well before shooting, and actors may have input after reading the script and during shooting. If it’s not central to the plot, it may have been handed to someone elsewhere in the hierarchy. Then there’s art directors, production designers, and editors all directly touching the end result of what we see on screen. With interfaces becoming more and more part of sci-fi movie making, the teams are getting larger and more specialized. There may be one team whose responsibility are on-set interfaces that the actors see and touch. Another team might be handling the post-production interfaces that are built after principal shooting. One individual might do the graphics as static elements and another do the motion design. Final assets produced by designers may be cut up and remixed by editors (without consulting the original designers) to meet the narrative needs of the flow of the story, so what winds up on screen may not be what was originally designed. Given all of these people, where is the line of who is and isn’t the designer? Or even the design team? Is it everyone? Is it just “the designer?” Who is that in this complicated case? Who gets the credit? Posted in Prometheus (2012), ~Meta. Click this link to display the Prometheus posts in chronological order. 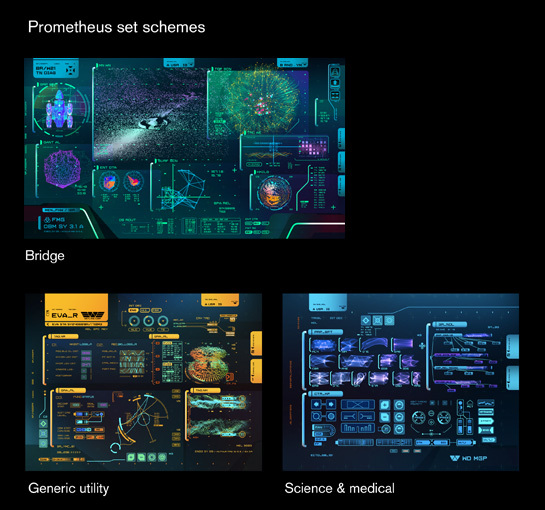 Midway through the reviews of the Prometheus interfaces, I was delighted to receive an email from the lead designer for the on-set graphics on the movie, Shaun Yue. Since I must evaluate television shows and films as an outsider, it was great to have Shaun’s insider perspective on how and why things get done the way they are. What follows is an email interview conducted with Shaun about his work on the film. Shaun was also kind enough to share some larger images of screens in development, which are included throughout. What was your role with the Prometheus sci-fi interfaces? Shaun: I led the visual design of the on-set physical interface graphics. Based at Pinewood Studios for principal photography of the Prometheus ship interiors, I developed the design templates for the set graphics and helped oversee the design team of five which were based remotely around London. The overall on-set graphics supervisor was George Simons, who managed the logistics, determined the deliverables based on the script, specified hardware requirements and was the key liaison between the production departments. We were both working for set-decorator Sonja Klaus who along with production designer Arthur Max are long time collaborators with Ridley Scott. Could you describe the creative process with Ridley Scott? Sonja and Ridley were quite keen that we incorporate novel colours and shapes into the screen design. Sonja’s reference point wasn’t computer interfaces, but rather more broad visual references such as luminescent underwater wildlife and astrological photography. They were keen that the visual language be so futuristic that the technology appeared almost foreign and unrecognisable to contemporary viewers. It was quite a challenging brief, as basing sci-fi graphics on reality is a powerful method for making designs more believable to the audience. Regardless of how far in the future we speculate, usability and functionality are key, especially when the script requires the audience to read the design immediately for storytelling. As a fan of the original Alien’s robust, utilitarian screen design, I thought it would be a shame to completely disregard it. However, in meetings with Ridley, he always made reference to visual artists, such as the constructivist works of Rodchenko, rather than objectively predicting the future. I think the key to responding to this challenge was to embrace that Ridley has an intuitive and artistic visual approach to filmmaking. Essentially he saw screen design as an extension of this sensibility. For our design team, the process was all about trying to loosen up the design rules, not being too rigid with grids, and especially playing around with negative space. We layered shades of transparent gradient windows on top of each other and really just approached the design in an impressionistic way. We saw the screens as the equivalent of moving artworks, I self-rationalised it almost like an AI reconfiguring the design bespokely to its context! To try and keep things sympathetic to the design of the ship, which was robustly industrial and structured, we overlaid some more defined graphic elements to hold the design together and make it a little more functional, the single line “holding” bracket, header and tab structure, recognisable data elements and button iconography. In the end the design process on a film is largely about facilitating a collaboration between the various production creatives to reach a goal that satisfies the director. How are decisions made over the course of production? How did you collaborate with other departments? Working concurrently as sets were being designed and built meant we had to be flexible in responding to the changing iterations leading up to shooting. A prime example was the bridge. Ridley envisaged a lot of holograms throughout the set, but the CGI proved cost prohibitive. We did camera tests with the DOP, Dariusz Wolski, to project onto perspex panels. The images were a bit soft, but the advantage was the realistic light spill and live images cast onto the actors and set (a bit reminiscent of the opening scene in Alien). In the end it fit with Ridley’s style to shoot as much for real on set. The art department had to design full size mockups of the pilot consoles to house projectors and a mirror to bounce the projection back onto the perspex. Also a foam core mock up console with fitted with functioning displays helped present the animated designs to Ridley in context. Also on the bridge, Ridley was wanted a visual representation of the descent to LV-223 depicted on the screens. He could describe and sketch in great detail the Prometheus’ trajectory to the surface and its surrounding terrain. The visual effects department had explored some options with pre-viz of the two merged locations being used for the planet exteriors (Wadi Ramm in Jordan and Iceland). We used their merged geo-data to define the terrain and map out a descent visualization from the live perspective of the Prometheus. 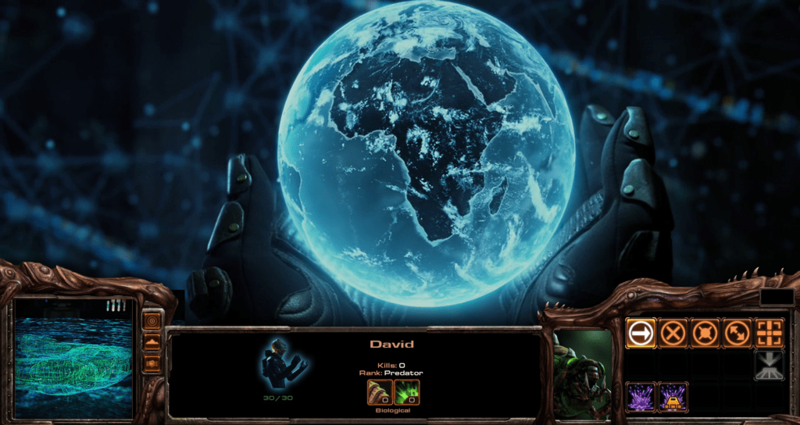 It resulted in a 4 minute long animation from atmosphere to the surface. It was vastly more than required for the final film but preparing material to be shot on set required a lot of extra redundancy for shooting coverage, and also gave something for the actors to respond to. A vital part of on-set screen design is collaborating with the playback technicians to produce animations which are technically feasible to playback and control on-set for shooting. Sonja was quite keen on touch screen interactivity so we worked with Mark Jordan’s team at Compuhire to create interactive door and control panels which the actors could press and have reactive animation. This was most prominent in the medi-pod cesarean sequence, which had several interactive stages determined by the script. All the buttons were highlightable and controllable, but the activation was quite simple so that Noomi Rapace did not have to memorise complicated controls or gestures when delivering her performance. What is your background? Are you a designer or an SFX artist by training? I studied Multimedia Design at Swinburne University in Melbourne, Australia. It was a mix of digital media, web, animation, film and graphic design. I briefly worked as a web designer before moving to animated and live-action commercials, and then was a lead designer at the Australian Centre for the Moving Image (ACMI). In 2006 I moved to London and have been lucky enough to work on The Dark Knight, Call of Duty: Modern Warfare 3, Crysis 2 in addition to numerous commercials and music projects. What were the biggest challenges working on the film? Other than balancing interface functionality with Ridley’s aesthetic sensibilities described above, the biggest challenge would have been achieving the amount of work within a really tight schedule. We went from a blank slate to shooting in 12 weeks eventually completing around 250 screen designs. The other major challenge was responding to requests for design changes or even completely new designs during shooting. Some of the screens were shot were designed and animated the same day they were shot! The entire bridge was really satisfying as it was a massive set with so many screens, over a hundred designs working together. It was a great testament to the efforts of the design team so props must go out to our supervisor George Simons and the rest of the design team David Sheldon-Hicks, John Hill, Paul Roberts and Rheea Aranha. Also thanks must go to Sonja Klaus and Karen Wakefield for their guidance and integrating us into the set-decorating department. I’m personally quite fond of the medi-pod activation screen as it encapsulated all of the design challenges of an on-set graphic: it was detailed enough to be filmed close, it responded very specifically to the script narrative, and it was programmed to be interactive for the actor to perform with. The last thing which was quite fun was trying to squeeze in references to Alien. From the nondescript numerals measuring chemicals on the spacesuits, little references to Muthur, to the warning cross motif when Prometheus sets itself for collision, it was our way of trying to pay respect. What’s your favorite sci-fi interface outside of Prometheus? Kubrick’s 2001 for its consideration and relentless practical execution, and anything Dan O’Bannon’s designed for its narrative clarity and ingenuity. I wasn’t sure what could compare to working on Ridley Scott’s first sci-fi for almost 30 years, but I was lucky enough to spend most of last year working on Sam Mendes’ Skyfall. To be part of the 50th year of Bond and revisiting Q for the modern age through computer interfaces was pretty amazing. However, I’m interested in exploring some more speculative design ideas beyond the narrative and practical constraints of feature film production, so we’ll see what the future holds. Posted in Prometheus (2012), ~ Interview. Prometheus had an unreasonably high bar to vault. It had to work as a prequel to one of the most successful and revered sci-fi movies ever. It was directed by Ridley Scott, who produced Alien and another of the most successful and revered sci-fi movies ever. And in the 33 years since Alien premiered, Hollywood’s special effects capabilities have evolved beyond all ken, along with audience’s expectations of what makes for an exciting and engaging interface. Even cutting it a bit of slack for these massive challenges, it was quite a letdown for its ofttimes inexplicable plot, wan characters, science-iness, and getting so caught up in its own grandoise themes it forgot about being a movie. But here at scifiinterfaces.com, reviews must be of interfaces, and to that end I’ll bypass much of these script objections, to focus in on the tech.